What Is "Alias Smith and Jones"? 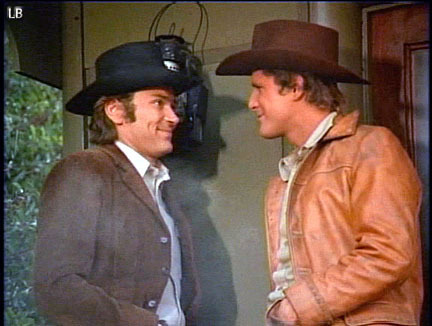 Briefly, the show is about two outlaws, Hannibal Heyes and Jedediah "Kid" Curry, who are trying to get an amnesty from the Governor of Wyoming; however, before the governor will grant the amnesty, they have to prove that they can go straight. So, they use the "aliases" of Joshua Smith and Thaddeus Jones while they are trying to get their amnesty because they are still wanted, dead or alive, for $10,000 each and 20 years in prison! Thus, everyone (the law, outlaws, bounty hunters, citizens, etc.) are trying to capture them and claim the reward, which forces them to still use their "outlaw skills" to try and outwit everyone to keep from being caught so they can get their amnesty. Hannibal Heyes is a former outlaw leader with a "silver toungue" and is good at thinking up schemes, opening safes, and playing poker (and other card games). Kid Curry is a gunman with an extremely "fast draw," which he uses to save both of them on many occasions. Together, they make a great team! I hope you enjoy your visit to my site!